Before a rundown of the Jazz & Ribs schedule, there is news this week of an annual source of world-class improvised jazz returning in early September. Details have been announced for the 2017 Hot Times Kate Schulte Tribute jazz series, taking place around Columbus September 6th – 10th, including a very prestigious addition to the lineup. From the Kate Schulte Foundation: “Jazz great Hamiet Bluiett, whose baritone sax graced the series for the past two years, will probably not be able to return due to illness. Instead, the amazing James Carter will fill the low end of the music. Award winning composer and pianist D.D. Jackson will return for his third appearance. Edward ‘Kidd’ Jordan, the program’s Artist-in-Residence Emeritus, will make his sixth consecutive appearance dating back to the first Tribute in 2012. These Artists-in-Residence will perform concerts with Columbus’s The Jazz Poetry Ensemble, give workshops, and collaborate with TRANSIT ARTS. A complete schedule will be released soon. Confirmed dates include Sept. 6 at Natalie’s Coal Fired Pizza, Sept. 7 at the English Community Center, and Sept. 10 at the Hot Times Community Arts and Music Festival.” Stay tuned to the tribute website for updates, and look for a full preview on our website soon. While we provided the full festival schedule here, I wanted to rundown some jazz highlights of the fest as I see them (NOTE: I refer below to the different stages with the following codes: AEP = American Electric Power Stage in Bicentennial Park, GP = Genoa Park Stage, WB = West Bank Stage). As usual, the Friday schedule kicks off hot and heavy at 11am with two-hour sets on all three stages for the downtown lunch crowd, including the sizzling rhythms of Cleveland’s Sammy DeLeon & His Latin Jazz Ensemble (WB). The afternoon continues with great sets including the return of guitarist Zakk Jones’ Screeching Owl with an all-star sextet lineup (2:30pm, WB) and the top-level cohesion of Dayton pianist Keigo Hirakawa and his Trio (2:30pm, AEP). Options for the gathering dinner crowd include young Cincinnati group ECO Quartet with a tasty brand-new EP (5pm, WB) and the full-bore jazz-pop of the Liz Woolley Band who recently released the excellent Something I Can Feel (5pm, AEP). Urban Jazz Coalition, Columbus’ own unflagging international smooth jazz powerhouse, will pump up the nighttime crowd (7pm, AEP). Friday headliners include straight-ahead jazz hero saxophonist Kenny Garrett’s Quintet (9:30pm, AEP), storied New Orleans brass band Rebirth Brass Band (9:30pm, WB), and smooth jazz titans Jeff Lorber, Everette Harp and Paul Jackson, Jr. as Jazz Funk Soul (9pm, GP). Another strong trio of performances will greet Color Run participants and other early-goers Saturday, with young Columbus talent represented by the Fort Hayes All Stars (11am, WB) and the veteran power of Tim Cummiskey’s Fusion Syndicate paying homage to the recently departed fusion giant Allan Holdsworth (11am, AEP). The youth movement continues with the high-powered Columbus Youth Jazz Orchestra joined by special guests including legendary drummer Jim Rupp (3pm, AEP). A soulful swath of dinnertime sets includes Chicago’s powerhouse Chris Greene Quartet (4:30pm, WB). 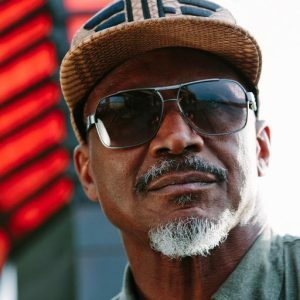 Another strong ledger of headliners is topped by the energetic and funky jazz-jam sounds of Karl Denson’s Tiny Universe, who played one of my favorite sets of 2016 (9pm, WB), but don’t forget about Latin jazz juggernaut Papo Vazquez Mighty Pirate Troubadours (9:30pm, GP). An early arrival is once again recommended for Sunday, as the Mark Lomax Trio will unite the prolific drummer and composer (read our review of his new highly-recommended Drumversations here) with longtime collaborator Eddie Bayard (tenor sax) and celebrated bassist Roger Hines (11am, WB). The West Bank Stage continues its hot start with the lively fusion of drummer James Gaiters’ Watu Utongo, who I was very happy to see live recently, this time featuring vocalist Janeen Holmes (1:30pm, WB). The always lively Pete Mills Quartet will present swinging afternoon sounds (2pm, GP), and Yumbambe, one of my 2016 festival favorites, will cook through the heat of the day with powerful Latin grooves (4:30pm, GP). A varied final slate of headliners ends the day, with the Miles Electric Band‘s lineup of past Miles Davis collaborators and its focus on Davis’ electric period sure to be a great way to close your 2017 festival experience (7pm, GP).